We hope you all had a good summer. 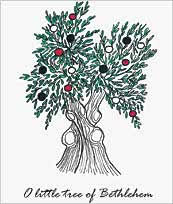 It was not so good for Gaza or the West Bank, where the oppression by the Israeli army and the aggression from the illegal settlers increased greatly. In Sabastiya things were quieter, although two young men were shot at a demonstration in support of Gaza organised by the villagers. Both were admitted to hospital but are now back home. 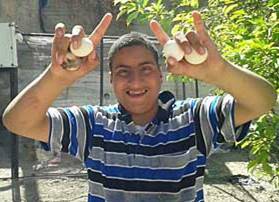 Our main project in 2014, populating Sabastiya with hens and cockerels, was a great success. 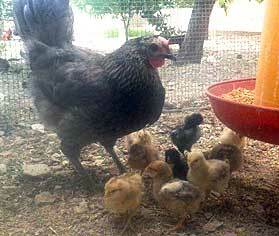 With your help, we managed to buy 420 hens and 30 cockerels for 84 families. Although around 20 died, many have produced chicks. 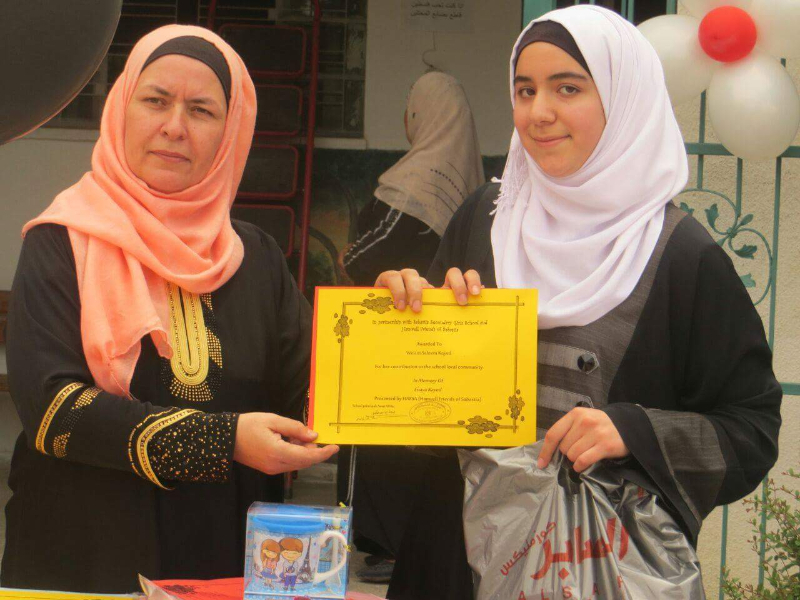 Projects that help Palestinians to become self-reliant are much appreciated and we will be looking for a new project for 2015. One suggestion is to find a way to recycle household waste water (grey water) to feed the vegetable gardens. Andree will be spending three weeks in Sabastiya this November and will investigate cost and implementation. If anyone has any good suggestions regarding this, please email us – we could do with some expert knowledge! 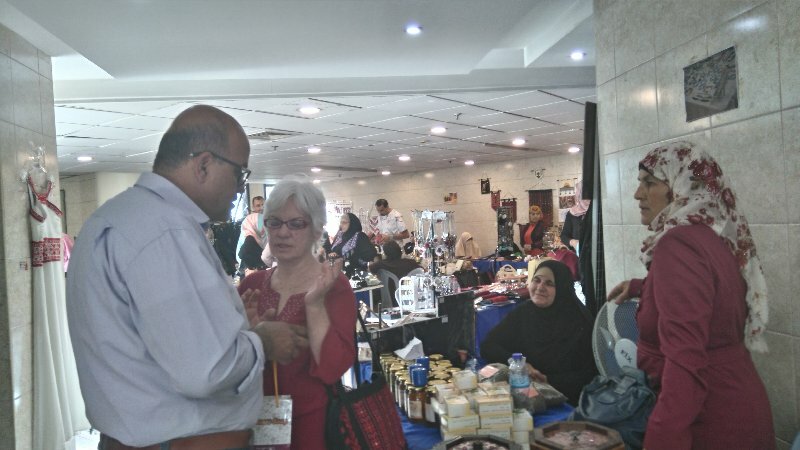 The Gaza situation has badly affected the tourist trade, which has fallen by 60% throughout Palestine. 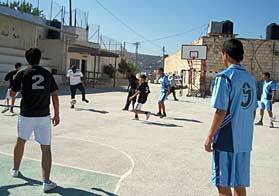 The Al Kayed Guest House, which we have supported, has had many cancellations well into the autumn. This is a problem for the family running it, as they still have to pay rent. Andree still hopes to be able to take the Zaytoun Harvest Tour group to stay there in November. Spring 2014 saw us leading the Twinning Network tour. We visited Jerusalem, Bethlehem, Ramallah, the villages of Bil’in, Burqa and Faquoua, Nablus and, of course, Sabastiya – where we stayed for three days and witnessed the invasion by an Israeli construction company taking over the ruins areas to develop them into an Israeli-run tourist attraction. The villagers protested, we lobbied our MP and wrote to the British Consul in Jerusalem for clarification as to what was going on. At present, the work has halted, but it is not clear to anyone, including the Mayor, what will happen next. 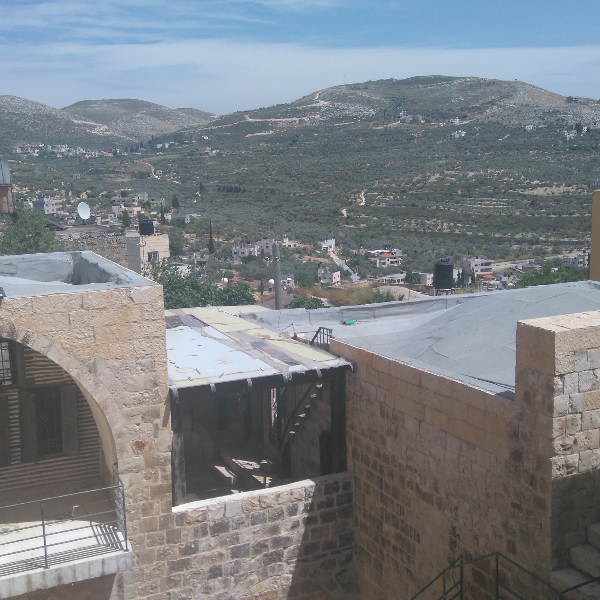 The villagers are forbidden by Israel from developing the area themselves because the ruins are situated in Area C (as per the Oslo agreements of 1992) which they control. We are keeping an eye on developments. 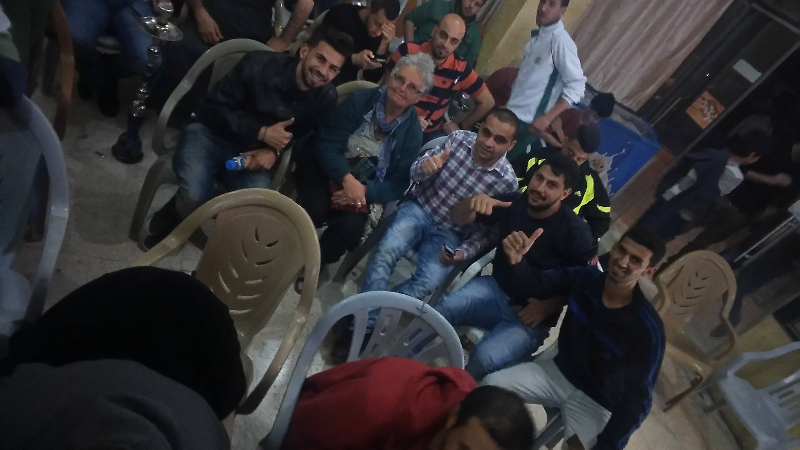 Two Brentford FC football coaches joined us in Sabastiya (left) after coaching the Palestinian Olympic team and football teams in the refugee camp of Al Bireh/Ramallah. 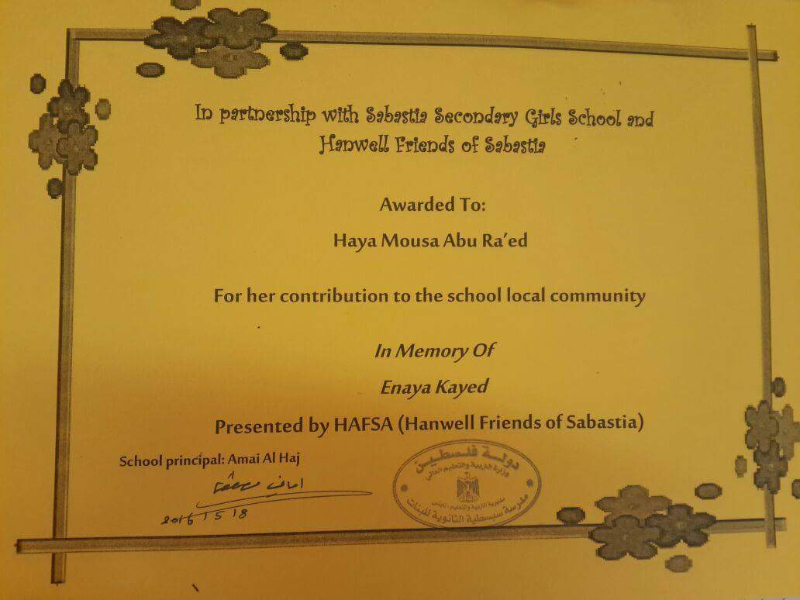 This project was organised jointly between us and the Hounslow Ramallah Twinning Association. We hope to develop strong links with Brentford FC who are quite supportive. The coaches, Ryan and Josh, got a great welcome in Sabastiya where they coached the school team and the young Sabastiya team. 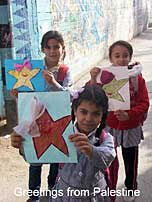 They were two great lads who communicated with everyone and were keen to learn more about Palestine. In Summer we had our usual stalls at theHanwell Carnival and Brentford Festival, selling cakes, books, lavender bags, Zaytoun fair-traded Palestinian products and raising our profile. This year’s Ramadan celebrations were dire because of the Gaza situation, but it is hoped that the next Eid on 5th October will be more festive. Last year during Ramadan we provided food parcels for 50 poor families. This year we have decided to buy shoes for the 20 disabled children and adults in the village who are largely from poor families. Eid is a time when people buy new clothes, etc. The cost of this project will be £370. This may be not very sustainable, however, as with the Ramadan parcels, it will be greatly appreciated by the recipients. These cards have now been printed and are ready to go! 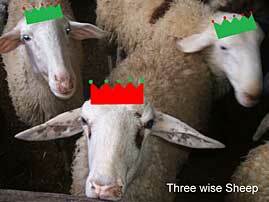 The “Three Wise Sheep” and “Greetings from Palestine” (featuring 3 girls holding stars) photographic cards will be sold in packs of four at £4 (2 of each). As ever, we have plenty going on! An evening meal at a local Middle Eastern restaurant. Venue TBC, as we are still negotiating with restaurants. Autumn Feast: food, quiz, raffle and more – please support and bring others, this is one of our main fundraisers. Venue: Jean and Colin’s, 109 Southdown Avenue W7 from 6.30pm onwards. Entrance £10. Abu Santa’s Grotto, from 2pm-6pm. High tea (cucumber sandwiches, delicious homemade cakes, scones and more!) provided plus the chance to buy new and nearly new goods at very reduced prices. If you have, or can get hold of, items in good condition or, even better, unused, please donate for this event. Venue: Andree’s, 93 Oaklands Road, Hanwell W7 2DT (020 8567 3446). Entrance £2. HAFSA AGM- 3pm to 6pm, at St Thomas Church, Boston Road. Programme to be announced at a later date. One of our member has taken the initiative to start a silent vigil for Gaza and Palestine every Saturday 12 to 1pm, outside Sainsbury’s (to the left of the library), in West Ealing. Please bring your own message/poster, or just come along for all or part of the time.